Julian must often have looked on these scenes of ruin in Arras. 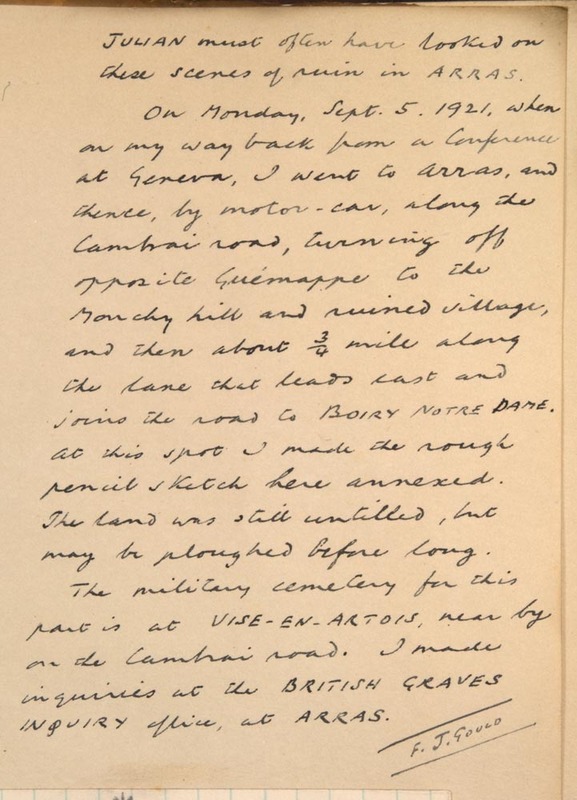 On Monday, Sept. 5 1921, when on my way back from a Conference at Geneva, I went to Arras, and thence, by motor-car, along the Cambrai road, turning off opposite Guémappe to the Monchy hill and ruined village, and then about ¾ mile along the lane that leads east and joins the road to Boiry Notre Dame. At this spot I made the rough pencil sketch here annexed. The land was still untilled, but may be ploughed before long. The military cemetery for this part is at Vise-en-Artois, near by the Cambrai road. I made inquiries at the British Graves Inquiry Office, at Arras.